I love fall. It vies with spring for my favorite season of the year. It's become ever more dear to me since moving to the south, because it brings cooler temperatures and a blessed reduction of the intense humidity. I love the sound and smell of autumn leaves as Isaac and I crunch through them on our "nature walks." (These involve the two of us each pulling a wagon through our yard and picking up sticks, leaves and acorns.) And, I love to make homemade apple sauce! I don't want an apple-smelling candle - I want the real thing. This year, a friend picked up a box of Winesap apples for me when she went to an orchard, as I didn't think I would have a chance to go. Then, another friend wanted to get some Pink Lady apples, so the kids and I tagged along, and we got a box of Pink Ladies as well as a bag of Fujis. This added up to a large quantity of apples in my garage. Time to get cooking! My husband does not like "chunks" in his apple sauce. After we were married, his mom gave me his grandmother's Foley food mill. I had never seen one before. Have you? It looks like a little pot with a piece of a propeller inside. The blade squishes the applesauce through the sieve-like holes in the bottom, keeping the peels inside the pot. It's a wonderful tool. I love that I don't have to peel the apples first. My sister-in-law told me once that she is "lazy," and doesn't want to use a food mill, so she peels all her apples first. Her family doesn't mind the chunks. That's not lazy! Peeling apples is time-consuming work! I would rather not peel them and use the food mill. There is a fabulous website that tells you what produce is in season in your area, and where you can go to Pick Your Own. 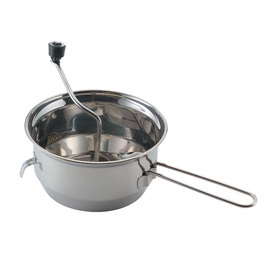 They also describe any equipment you need, as well as providing instructions for preserving. 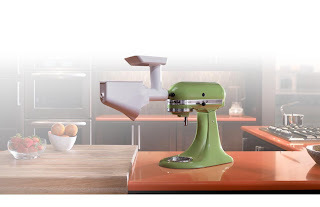 While I was looking for places to pick apples, I saw this wonderful attachment for my KitchenAid mixer. It is called a Fruit and Vegetable Strainer. You have to have the grinder attachment to go with it, and I had that, also thanks to Todd's mom, who gave one to me several years ago for Christmas. You put two bowls under it: one to catch the applesauce, and one to catch the peels. I tried this out for the first time yesterday, and I LOVE it! It makes apple sauce much more quickly than using the Foley. Even with a sick boy, I was able to make three batches yesterday. After the first batch, I thought I might need to run it through the strainer twice, because I thought I saw apple still in with the peels. I tried that, and ended up with bits of peel in the sauce. Not what I was going for. The old Foley is a great tool; you can keep turning that handle until every last bit of apple is off the peel. However, the KitchenAid attachment is a great time-saver, and doesn't drip rust, which is a major point in its favor. The best part of getting locally-grown apples is not having to add any sugar to the apple sauce. I just throw in a cinnamon stick while it's cooking. Winesaps and Pink Ladies are listed on the Pick Your Own site as "good" for apple sauce, as they are not as sweet as some varieties, but since they were ripened on the tree, they are plenty sweet enough for us. I don't have a particular "recipe" that I use, but so far, I've used 5 Fuji apples and 10 Winesap apples per batch. The kids decided they'd rather eat the Pink Ladies, so I will save those for last if we don't get them eaten quickly enough. Can you get apples in your area? Do you make homemade apple sauce? If you've never tried it, you should consider it. It's not difficult, and it's so much better than anything you can get in a store. Advent Traditions - What Are Yours?